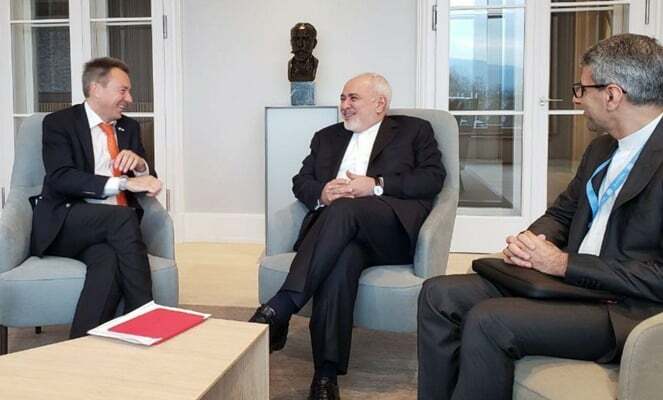 Iranian Foreign Minister Mohammad Javad Zarif, who is on an official visit to the Swiss city of Geneva, held talks with Peter Mauer, the President of the International Committee of the Red Cross. During the Tuesday talks held at the UN headquarters on the sidelines of the Geneva Conference on Afghanistan, the two sides exchanged views on mutual cooperation in Yemen, Syria and Afghanistan. Zarif once again expressed Tehran’s preparedness to take part in humanitarian projects in the mentioned countries. The two sides also discussed the US’ unilateral food and medicine sanctions on the Islamic Republic of Iran and stressed the need for international bodies to step into the fray to end the sanctions. Organized by the UN and the government of Afghanistan, the two-day Geneva Conference kicked off earlier Tuesday with high-ranking officials from over 60 countries as well as a large number of representatives from international bodies in attendance.